The answer to last week’s question is. 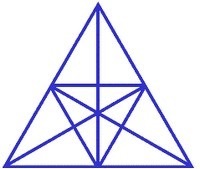 Q: How many triangles can be found in the diagram? This week’s thinking challenge is. Q: HAL 2000 is the name is the name of the famous super-computer featured in the movie “2001: A Space Odyssey”. There is a curious relationship between HAL and the computer manufacturing company IBM. Can you describe it? The answer along with a new thinking challenge, next week.